A series of "Inchies", practically microscopic 1 inch by 1 inch drawings, are being listed in the coming days. An affordable way to buy unique art for you or the person you love. The fund-raising for our adoption will continue over the course of the coming years... Each step marked by small goals. Goal One: We received word that the Agency accepted our application. And have since submitted the first batch of contracts and a couple of the first program payments. A big thank you to all the wonderful Etsy shoppers who have already supported our dream to become parents; and our dream to give a loving home to a child who needs one. "Mob Hit": Poor dog, soon he will know the world of pain that awaits him. 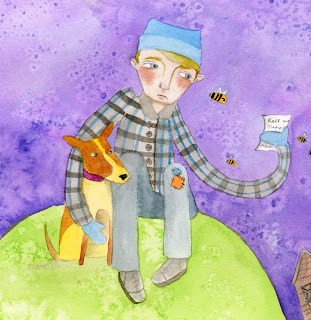 The book illustration continues this summer... We now meet Sasha, our new friend from Russia. 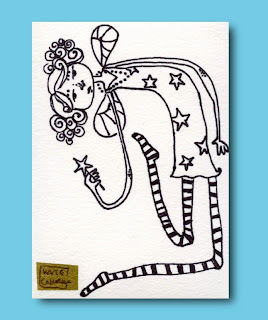 The 'Make a Wish' fairy is already fluttering away to her new home, but there are plenty more ink doodles going up on 'art4adoption.com's store everyday. 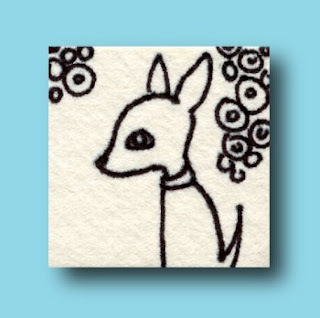 Be sure to check them out, the prices are super low and the doodles are super cute! Favorite painting of the week... 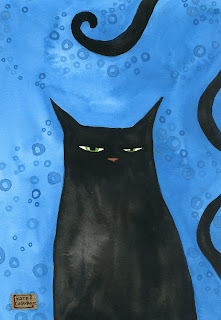 I don't paint a lot of black cats, but this one will probably inspire a few more. See more art from this week in my ebay store. 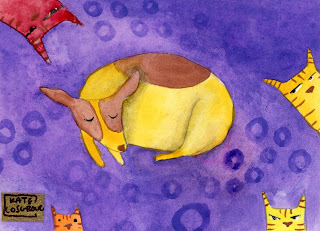 Looking at a group of ACEOs you would have no trouble picking out Kate Cosgrove's work. Primary colors sing, broken only by an occasional bubble in a different shade, the fizz that keeps the background from being completely flat. This bright warm color surround figures with elongated black & white striped legs, wobbling their way into...well, probably into some kind of fun. I remember the first Cosgrove card I ever saw. A purple and orange cat glares. "He can't relate to humans," reads a scrap of newsprint above the slitty-eyed figure, a perfect mogie attitude that immediately captured my attention. His tail, at least two yards long, curls in and out of the picture leading you back and forth until you can't help but giggle along with the artist, because you know she has got to be laughing to create something like that. "My 'Fun Art,'" says Cosgrove, "explores the jokes of everyday life and injects a little silly in the world - something I think we could all use right now." Does it work? Yes! says the people who collect her art work. As well as using art cards as a way to develop the themes for her larger works, they are also a way for Cosgrove to reach out. "Through eBay sales," she tells me, "I have grown attached to many of my repeat customers. Some of them have major burdens in their lives. Some have serious health issues, are shut-ins, or others are caring for ill family members. They have all told me that when the art they purchased arrives at their homes, and not just mine, that of other artists as well, it lifts them up and the pain lessens. I can't think of a better compliment than that!" Kate Cosgrove grew up in a small Michigan town, where she "wore too much black and never quite fit in." Still wearing a lot of black, Cosgrove graduated with honors from Michigan State University, where she majored in graphic design and minored in painting. She remains a regular exhibitor with the Lansing Art Gallery, as well as showing in other cities. "I was a corporate graphic designer for 6.5 years" Cosgrove writes, "but cube life was not for me! I was a sad little bird in a cage. In August, I quit to pursue art full-time. I still do a little freelance design when I need to, but my main focus is fine art and illustration." As for other artists, Cosgrove advises, "The beauty of the ACEO is there is no wrong way to do it. Don't pay attention to what everyone else is doing - find your own unique style. And never stop experimenting." 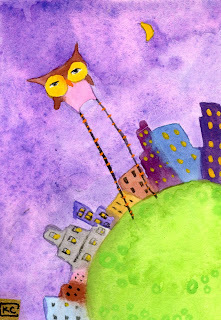 See more of Kate Cosgrove's work at www.katecosgrove.com. Labels: article about art by kate, llc.